The LKS connectors range has been specifically designed for professional lighting applications. Even maintaining full compatibility with Socapex SL 419 series, LKS connectors represent a real breakthrough in terms of reliability and safety. 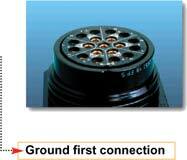 Featuring moulded contacts, they accept from 1.5 to 2.5 mm wires. The neoprene insert guarantees greater reliability as well as the possibility to insert and eject contacts for crimping and maintenance. The hardened anodised finish guarantee high scratch resistance and the backshell design allow adequate working room for crimping operations. LKS is provided with IP 68 watertight cable clamp. 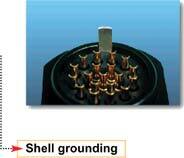 Military standard pins featuring contact retaining spring on female contacts, to enlarge contact area. 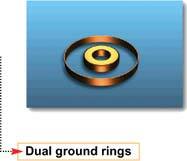 Ground First connection Contact retaining springs Dual ground rings IP 67 Waterproof Gold plated solder or crimp style contacts Suitable in Pg29 and Pg36 versions Both locking ring and back shell have been specifically designed to allow a perfect grip when heavy gloves are worn.